We won’t say the the CT8 has been canceled, but more mothballed. At least that’s what I’m telling myself. You have the blueprints in that gorgeous vehicle shown above. RIGHT THERE. Make that, and you’ll sell plenty. I get that the business decision to ax the big daddy flagship most likely made a ton of sense, but what are you left with if you don’t have a damned FLAGSHIP?! This car has been the inevitable outcome since the second generation CTS in 2008; that car was Motor Trend’s COTY. And it had the damned STS to be paired with. Yuck. But the CTS showed that Cadillac could do great things!! It could take on ze Germans in their backyard at the ‘Ring! It rode nicely and made many people forget about that other little Caddy that zings (screw the Catera). 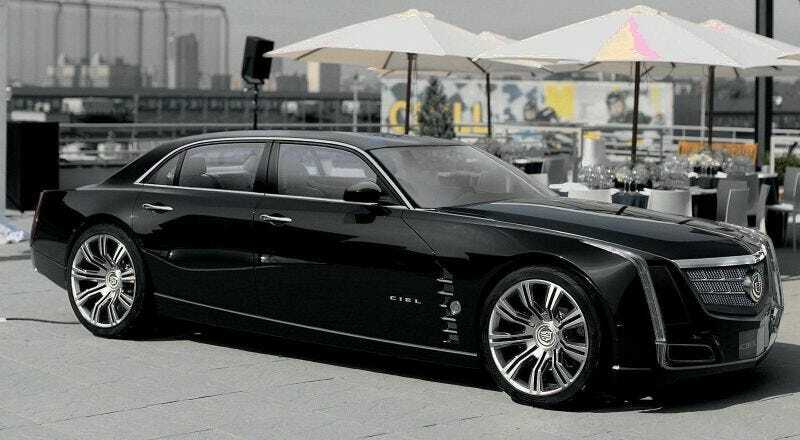 All of that was supposed to lead to the CT8: Cadillac’s redefining moment. It was their coming of age event. It was America showing the rest of the world that we still could compete with Luxury. It was the doorway to the future of transportation. Or at least it was supposed to do these things. And now, all Cadillac fans have to look forward to is the CT6 and possibly some bitchin’ engines attached to it. Which is cool and all, but not as cool as the CT8 would’ve been.